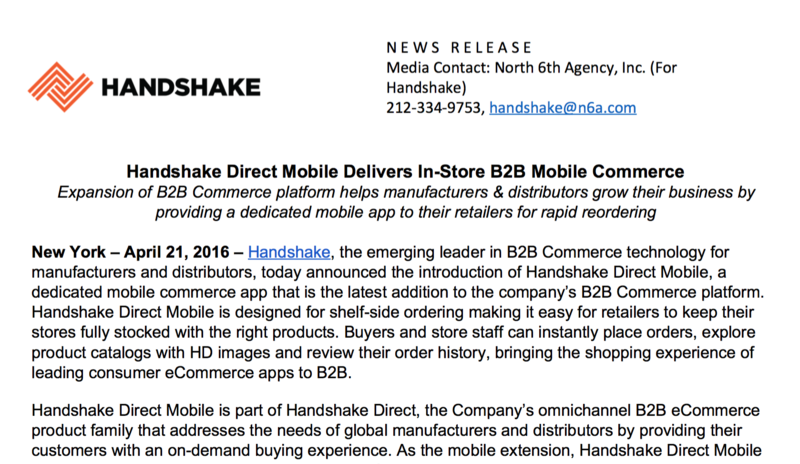 Handshake, the emerging leader in B2B Commerce technology for manufacturers and distributors, today announced the introduction of Handshake Direct Mobile, a dedicated mobile commerce app that is the latest addition to the companys B2B Commerce platform. Handshake Direct Mobile is designed for shelf­side ordering making it easy for retailers to keep their stores fully stocked with the right products. Buyers and store staff can instantly place orders, explore product catalogs with HD images and review their order history, bringing the shopping experience of leading consumer eCommerce apps to B2B.